Gardeners often have a strong opinion about the color pink. In truth, it can be challenging to work with. 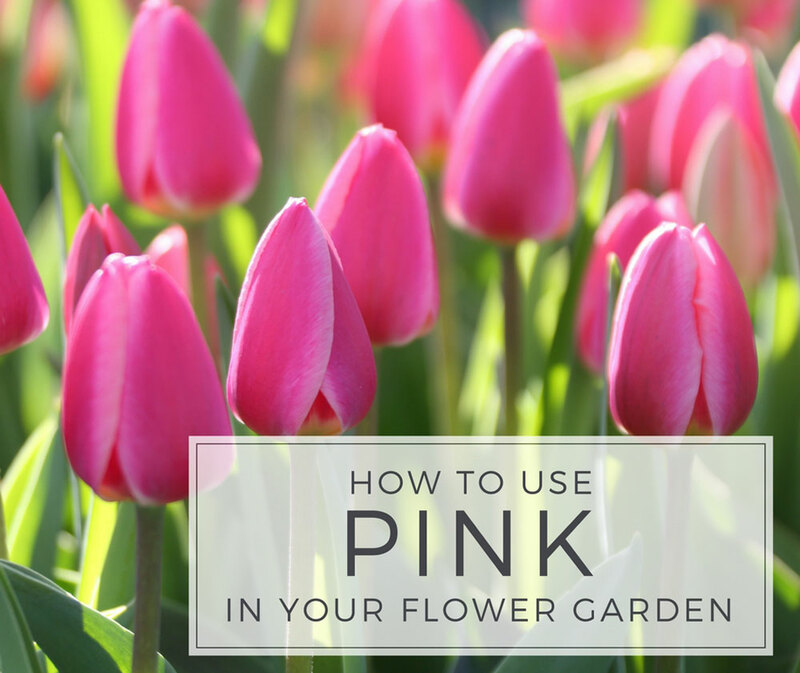 Read on to learn why that’s true, and get some tips and techniques for using pink in your flower garden. Cultural biases are the first challenge to overcome. 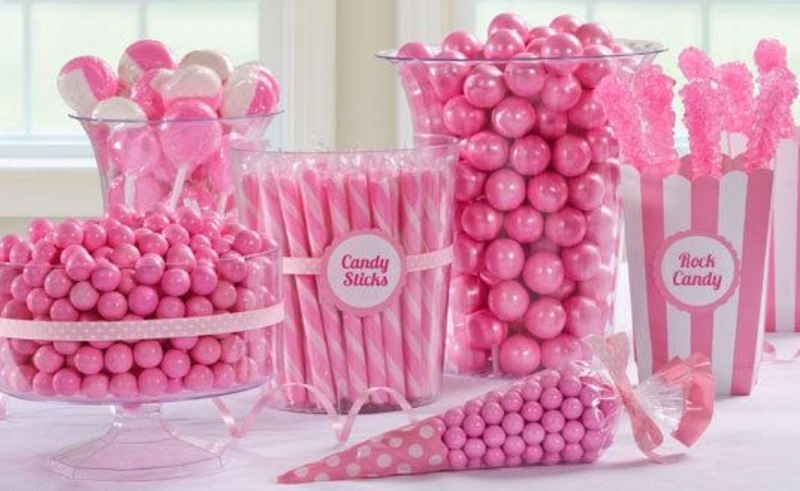 Pink is a color that’s often associated with sweets, babies, girls, cuteness, cotton candy and romance. When you’re designing a garden or home landscape, cute is rarely the goal, so many of us write off pink flowers without giving them a second thought. Yet pink is a color that can enhance almost every garden — as long as you know what kind of pink you’re dealing with. 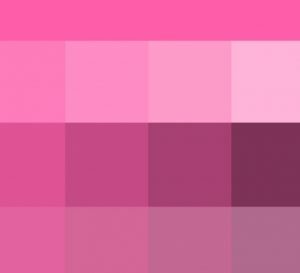 As a pure color, pink does not contain yellow or blue. It’s simply a pale version of the primary color red. In the image below, the band across the top is pink in its pure color. To alter this true pink hue, you can add white to get a “tint” or black to get a “shade”. Adding both black and white results in a “tone”. Tints, tones and shades are versions of the same hue, and when used together (as above) it’s called a monochromatic color scheme. When you change the temperature of a pure color, things start to get trickier. This is especially true with pink. So when choosing plants for your garden, you need to be able to recognize the difference between a true pink, a warm pink and a cool pink. 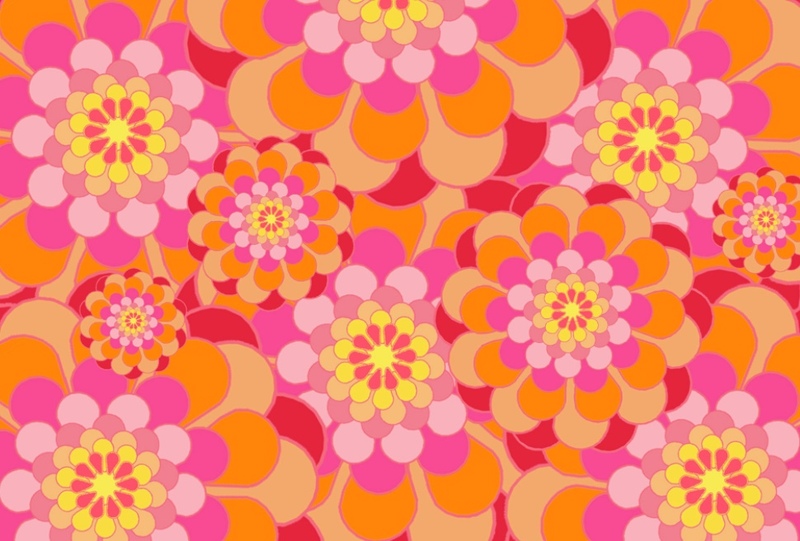 Warm pinks have names such as coral, peach, salmon and strawberry. If you were creating these colors with paint, you would be adding yellow to a true pink hue. Warm pinks tend to be calming and easy on the eye. 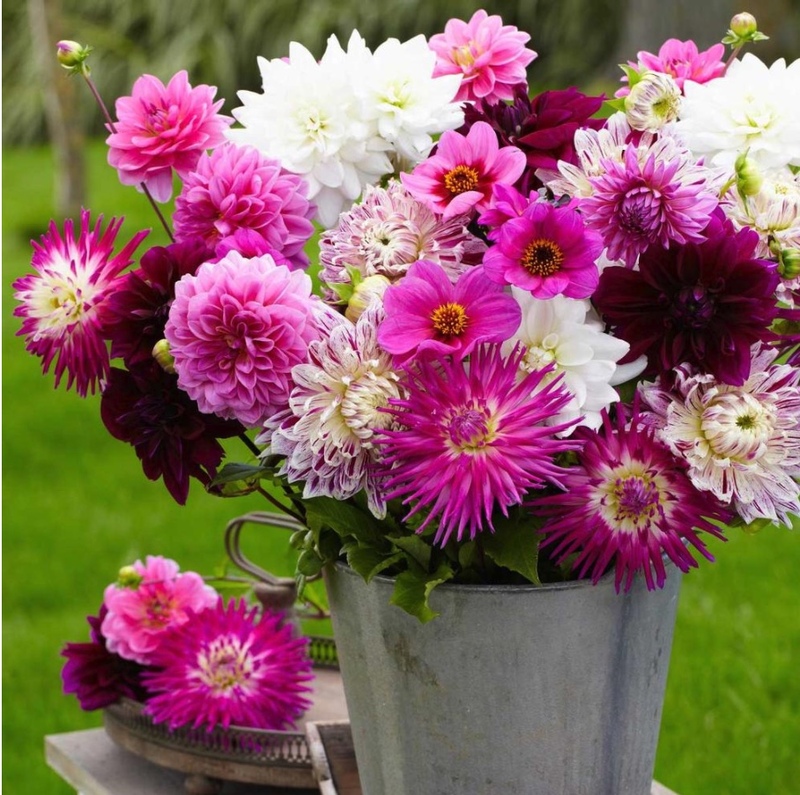 The names for cool pinks include bubblegum, carnation, fuchsia, orchid pink and hot pink. These colors are made by adding a little blue to true pink. Cool pinks are more energizing and a bit edgier than warm pinks. 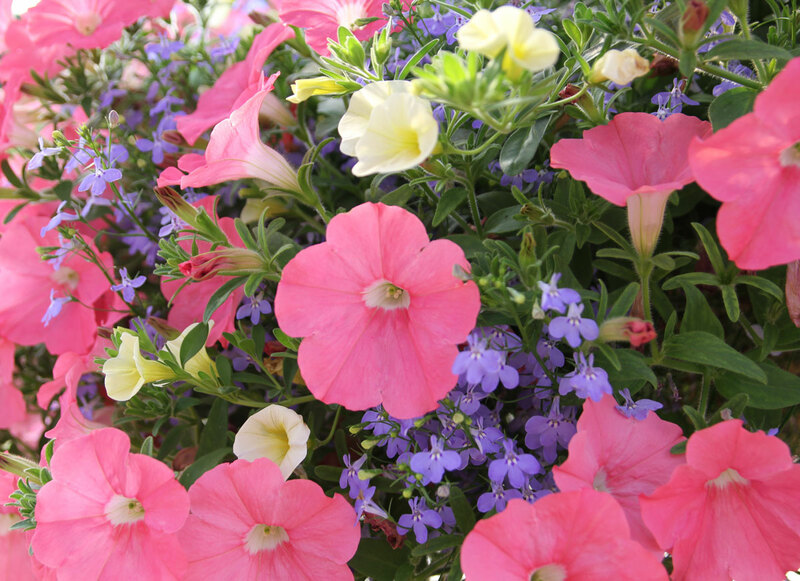 Though not a hard and fast rule, your pink flower garden will be more successful if you stick with hues on one or the other side of the warm/cool spectrum. Most people would say red and pink don’t go together. But in the photo above, taken at the Montreal Botanical Garden, you can see how that’s not always the case. 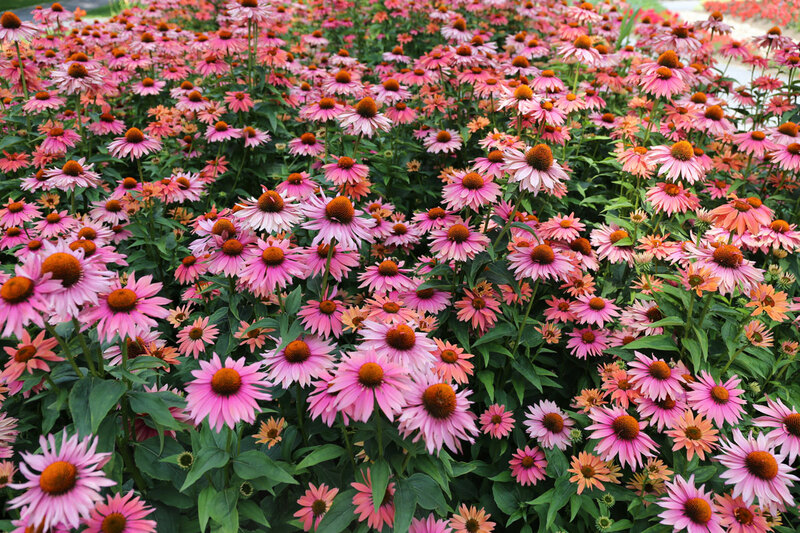 Warm pink echinacea (with its orange cones) actually works beautifully with warm red petunias and coral pink salvias. The key to success is keeping warm with warm. Had the garden designer planted fuchsia petunias rather than dark red, the combination would not have been as pleasing. 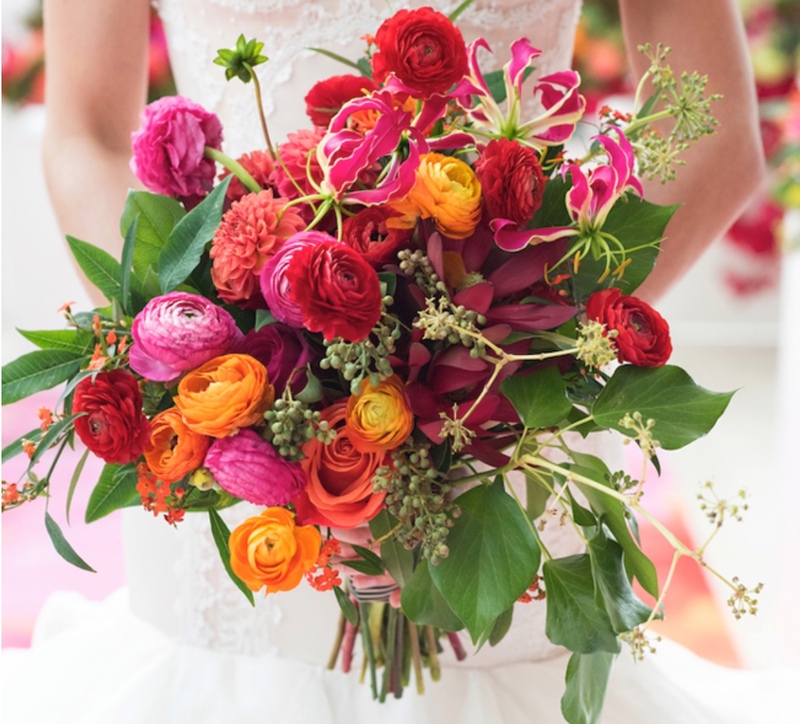 In this vibrant wedding bouquet, posted on Flirtyfleurs.com, you can see how beautifully warm pinks can be combined with orange and even yellow. Teal blue is warm pink’s complementary color (opposite on the color wheel), so plants with blue-green foliage always make good companions. 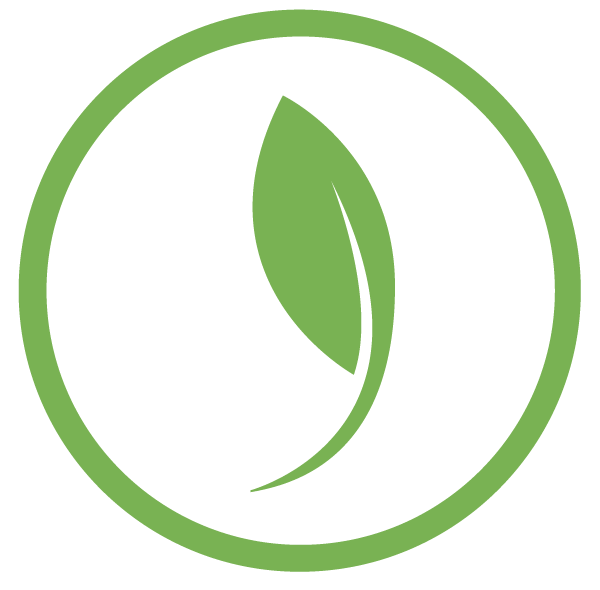 Examples include juniper, lavender, fothergilla, blue hostas and dianthus. Grey-blues such as lamb’s ears and dusty miller, and olive greens also look great with warm pinks. Pinks that have a slightly blue cast are called cool pinks. The best way to see the difference between warm and cool is to compare them side by side. Warm pink is on the left, cool pink on the right. 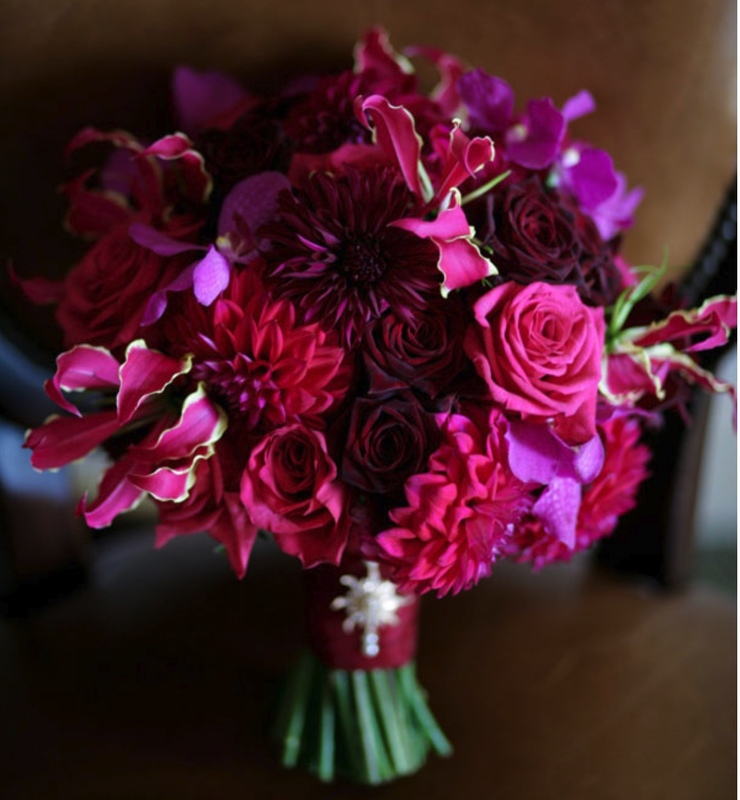 Flowers with a cool pink hue look beautiful paired with violet, burgundy and purple, all of which contain true red and varying amounts of blue. In color theory, these are called analogous colors, meaning they are adjacent to each other on the color wheel. When choosing flowers for your garden, combining analogous colors is almost guaranteed to give you a pleasing color harmony. For a more vibrant look, consider combining cool pink with orange and/or yellow. Teal blue and minty great also look fabulous with cool pink. Same with navy blue. 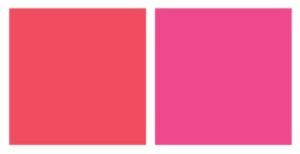 And don’t forget about incorporating lighter or deeper shades of true pink as they are also analogous colors for cool pink. 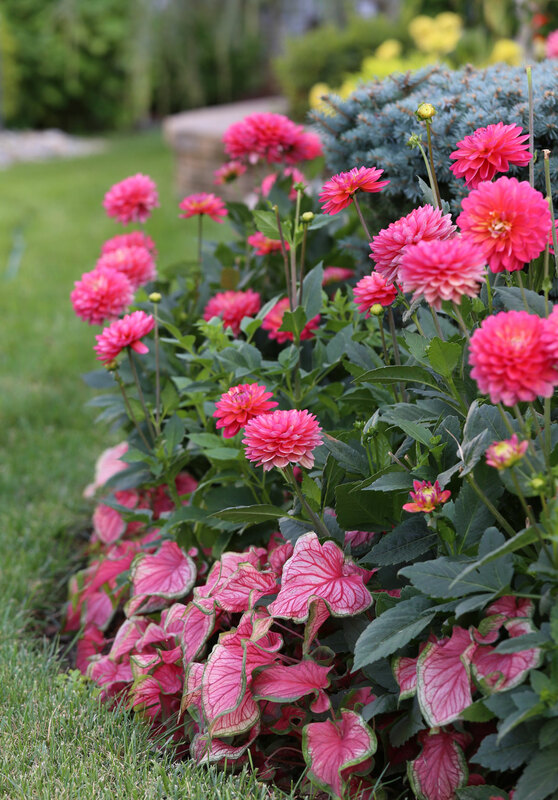 Cool pink’s complementary color is lime green, so be on the lookout for opportunities to incorporate yellow-green foliage. Grey foliage will take your garden in a very different direction, but it also looks good with cool pink. Anemone, astilbe, clematis, dianthus (pinks), dicentra (bleeding heart), dictamnus (gas plant), digitalis (foxgloves), echinacea (coneflower), eupatorium (Joe-Pye weed), geranium (cranesbill), hellebore, hemerocallis (daylily), hollyhocks, monarda (bee balm), papaver (Oriental poppy), peonies, persicaria, phlox, primula (primroses), pulsatilla (Pasque flower), Roses, Yarrow. Canna, dahlias, gladiolus, hyacinths, lilies, nerine, eucomis, crinum, ranunculus, tulips. 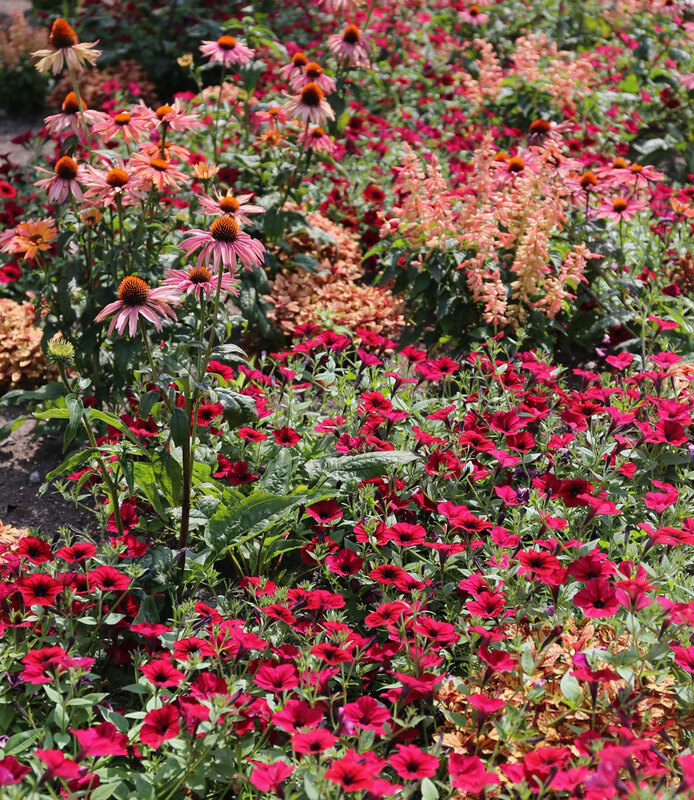 To learn more about using color in your garden, read Garden Color 101. 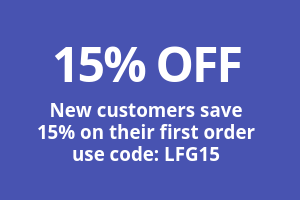 If you’d like to shop all of our pink bulbs and perennials for spring planting, click HERE. Very good info-thanks from an ol master gardener. I will share this with others. Hi Karen! So glad you found it useful. Thanks for sharing! Wow! Thanks for this info Karen reading it was like a light bulb coming on now I understand the color pink and can now design around my shi shi camellias and actually have a great working combination. Can’t wait to get started planting. Have u ever written a book on flower info like this ? Hi Jackie, I am one of those people who doesn’t love pink, so it was fun doing the research! Am planning to write more blog posts about color, so stay tuned! Another great post! Very helpful to me, as I use burgundy a lot. Hi Charlotte. I am a big burgundy fan, too! Just ordered a new dwarf, dark-leaved cotinus called Winecraft Black. Yeah!